Tips to Install Granite Countertops - Armchair Builder :: Blog :: Build, renovate, & repair your own home. Save money as an owner builder.- Armchair Builder :: Blog :: Build, renovate, & repair your own home. Save money as an owner builder. Whether you’re building a new kitchen from scratch or just freshening up an existing one, the install of granite slab countertops can provide a great new look. 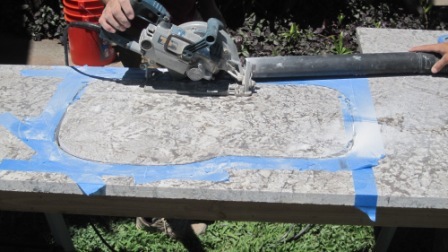 Here are a few tips from a builder to install granite countertops in your new project. Pros of Granite: Heat and scratch resistant, beautiful natural color, and custom look. Cons of Granite: Can chip if you hit it hard…especially on the edges, will stain if you don’t properly clean and seal regularly, seams are visible, costs vary greatly from one granite type to another and fabricator to fabricator (fabricator is the company that cuts and finishes the granite to fit your kitchen). So, you’ve decided to install granite countertops for your new project. What are the important items to consider? Costs: Granite slab countertops can range in price from $20 per square foot to well over $100 per square foot…it really depends on the type of granite (how abundant is it), your location, and the complexity to your kitchen layout. One tip for saving money on small kitchens and bathrooms…ask your fabricator if they have any remnants available. Remnants are pieces left over from a previous job. I have saved over 50% off the typical price on the install of granite countertops by using remnants. Backsplash: You have a bunch of options for backsplashes when you install granite countertops. If you go with a granite backsplash, you can either use a 4″ tall or full granite up to the underside of the cabinets. If you have a bar top, you will want to install a full granite backsplash in that location. If not, you may end up with an ugly look around your outlets. If you decide to install granite countertops with full granite backsplash, plan on spending the same square foot price as the main countertop. For my projects, tile has been slightly less expensive than a granite slab backsplash with medium to high grade granite. Figure $15-$25 per square foot for the material and another $20 per square foot for professional installation. 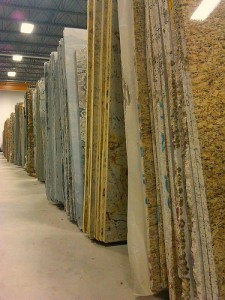 Edge Style: There are several different granite edge styles available for the install of your new granite countertops. If you want a modern look without a lot of extra cost, go with the eased edge. This is basically a square edge with the sharp corner ground down. One of the newer edge styles that can provide a really interesting look is the Rock Face. This edge looks like the rough edge of a stone that has been broken in half. It’s not for everyone, but it can provide a really unique look. Sink Type: If you’re going to spend the extra money to install granite countertops, you may want to consider an undermount sink. Undermount sinks attach to the underside of the granite and the granite company finishes off the edges of the sink cutout. This provides a really nice, custom look. The undermount sink will cost a little extra (versus a drop in), but the look you get is worth it. 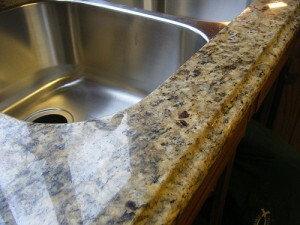 Typically your granite fabricator will supply and secure the sink to the granite. (sometimes the plumber installs it…make sure it you put this into one of these two contracts). Another popular sink type now is the farm house sink (also called apron front sinks). These are the sinks that come out the front of the base cabinet. If you decide to go this route, make sure you include the special sink base cabinet this sink requires. Faucet: No matter which faucet you end up choosing, make sure it is on site when the company comes to measure to install granite countertops. They need to know how big to drill the holes in the top (and how many). You don’t want to guess on this one. Once the holes are drilled, there’s no going back. Same goes for the kitchen sink. If your granite installer isn’t supplying the sink, make sure it is on site when they come to measure your kitchen. Overhangs: If you plan on putting an overhang on your kitchen island or at the bar top, be sure to support it properly. Typically, anything over 10″ (overhang dimension) needs support with either brackets, posts or steel plates. Check with your granite supplier to see what they recommend. Check out our previous article on granite spans. Seams: Ask the company that is bidding to install your granite countertops to provide a seam layout with their bid. Ideally, your new granite will have no seams, but because granite slabs are typically 9′ x 50″, you will have seams if your countertop is longer than 9′. If you’re designing your kitchen from scratch, you may want to take this into consideration in your layout. If a seam is needed on the top with a sink, I prefer to put the seam at the sink. This way, you have only a couple inches of seam in front of the sink and a couple inches behind…basically, you minimize the length of the seam. A good installer will use an epoxy the same color as the countertop to help hide the seam when they install your granite countertops…but it will still be visible. Turnaround Time to Install Granite Countertops: Any custom fabricated countertop like granite will add days to your new project schedule. The fabricator will need to measure your kitchen (sometimes called templating). Cabinets need to be installed in order to properly template a kitchen. Once the measurements are back to the shop, it will typically take anywhere from one to three weeks to fabricate and install your granite countertops. You will want to confirm the turnaround time…especially if you have a new kitchen remodel you are working on. Removal of Old Countertops: Have the granite company price out removal of the old countertops. This typically involves removing the screws, silicone or glue that attach the old countertops to the cabinets and then hauling away. My experience says it’s better to do this yourself (with a strong friend) if possible. You will be more careful…and it’s always cheaper. If your existing tops have a 4″ backsplash, take care in removing them. You want to do as little damage as possible to the drywall. Use a pry bar at the stud locations to keep from making holes. There will be minor drywall and paint touchups…it’s unavoidable. Plumbing Re-installation: You will be responsible for hiring a plumber to hookup the kitchen sink. If you have a cooktop, this will also need to be re-installed by your plumber/electrician. Thickness: There are two options available…2 cm and 3 cm. If you go with the 2 cm, you will need plywood to go on top of your cabinets prior to granite installation to support the slabs. In addition, you will have a seam at the edges…not a great look in my opinion. I typically go with the full 3 cm thick stone when I install granite countertops. It prevents you from having to mess with the plywood and eliminates the ugly seams at the edges. Granite slab countertops can provide a great, custom look for any kitchen. Using our professional tips above, you will be able to hire a quality company to supply and install your new granite countertops that will last for years to come. Before deciding on installing granite countertops for your kitchen, you must learn all the information about this type of countertop to ensure that you could render proper care for it to make it last. With the help of experts, you could have a greater chance of becoming successful with this task. Great article and awesome granite installation photos… thank you for sharing information such as this, it helps us all in the granite industry better educate our clients around the country through the internet. I agree 100% with the way to save by using granite remnants, many people don’t know that this is a great way to save a lot of money on their home project, and still get the awesome quality and natural look of granite. << What is Stormwater Management?